The government’s green paper on emissions trading has just been released. There are lots of interesting aspects to it. For instance, at least until 2014, it is a hybrid model with a defined price cap on permits; although surely to make that work it needs an elastic supply of permits at that cap a la Warwick McKibbin. I’ll have to read more to understand that bit. But on trade-exposed industries, it proposes to allocate free permits. For instance, if you emit a large volume of greenhouses gases per unit of revenue earned, you will receive 90 percent of your permit requirements (based on projected or actual output — it is hard to say) for free. At least this what will occur until 2020. On my reading, this gets the economics of the situation completely wrong. To show you that look at the following graph of a trade-exposed industry. Notice what happens when you move from the situation today to a situation where there are carbon permits but none are free. Output in the domestic industry falls from Q0 to Q1. What is more, while the emissions reduced by that contribute to Australia meeting its cap, the same emissions are likely to be produced elsewhere in the world and so there is no real contribution to the global environmental situation. Now suppose that 90 percent of the permits are given to the firm for free. What changes? Absolutely nothing. Why? These are tradable permits. That means if I choose to produce using a free permit, the opportunity cost is the value I could have sold that permit. 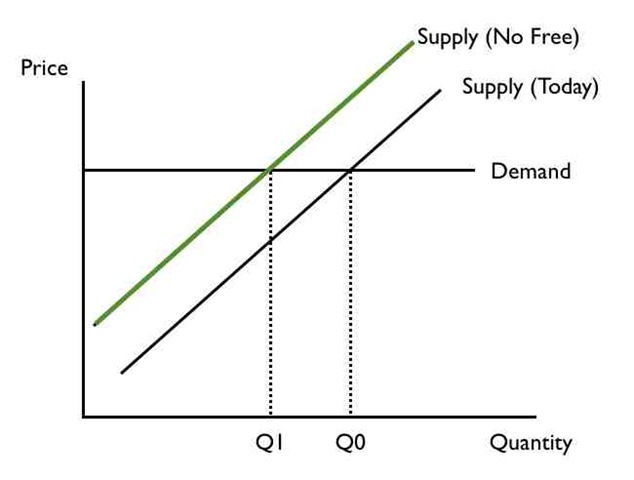 So Supply (Free) if you sketched it on this graph would be the same as Supply (No Free). Firm profits would have increased but the carbon leakage problem would remain. Garnaut recognised this and recommended direct output subsidies. That may be appropriate for export industries. For ones exposed to import competition, the alternative would be a tax on the carbon content of imports. That would increase demand up until exactly the point where the firm would be producing their original output level. But to the extent they can save on emissions, they can reduce costs relative to import competition and generate environmentally positive outcomes. Free, tradable permits do not solve the trade-exposed industry problem which is one of us not meeting our international obligations. In reading the green paper, there is a hint that they might not be tradable with the report saying that if activities are shut down the permits have to be returned. But the issue is quite open. To be sure, having just free permits that are not tradable may reduce the carbon leakage problem but not fully. Similarly, tying them to past year’s output or something might help a bit. But it is very messy compared to appropriate import price signals. All that said, there are bits of the scheme that are good: the commitment to low-income households, investment in new technologies and restrictions on the initial industries effected. This is going to be a long two years of design and anticipation. I will be interested to see how liquidity in the secondary market will be handled….if large numbers of permits are purchased merely for expiry (not for surrendering against obligations), will there be rationing of outputs for those firms that can’t secure enough permits (electricity, fuel, etc)? Borrowing against future permits might help somewhat, but that seems to be limited. How will the fine and penalty regime work, so that paying a fine isn’t merely seen as a substitute for buying a permit? Ideally, fines should perhaps be some multiple of the average market price for permits over the non-compliance period, but again, it will be interesting to see what is developed here. Agree completely Joshua, this is going to be an interesting policy development process. The “freebies” problem you point to seems very much like the errors made by the EU when introducing the EU ETS (although it was individual countries granting the freebies rather than the EU as a whole), and led to collapse of the carbon market. If businesses knowing the history of carbon trading prices in the EU predict a similar collapse in the price, incentive to fix things will also collapse. It seems that EU ETS is on the mend – prices have gone up 25% (in euro) or 35% (in US$) so far this calendar year. Do you have an opinion about the economics of the EU ETS, and whether it is worthwhile pushing international carbon trading by Oz joining the EU market (and avoiding much of the argy-bargy and politics about detailed implementation)? required regardless of permit cost. of permits in the market to make up the shortfall. For ‘Government to make good on behalf of non-compliant entities’? Surely this is a joke? Geoffrey Sachs had it right when he said that an Emissions Permits system would be abused because it is all too hard. This will always be the trouble when you try to do everything indirectly via pricing. The solution to aluminium and other such industries is to give them the same amount of power but from green sources. This can be done with existing solar thermal or existing geothermal technologies and if you do the sums the long term costs with today’s technologies is much less than the cost of fossil burning fuels – if done on a large enough scale and if the discount rate on money is less than 5%. Rather than varying the discount rate create some money that can only be spent on green energy generating infrastructure of your choice and the problem is solved. There is a big difference between a hybrid scheme and what the Green Paper proposes – the Green Paper says explicitly that it doesn’t expect the price cap to be set at a level well above the expected permit price. It is better to think of it as a penalty for exceeding emissions or a safety valve that will only operate if the demand for permits if marginal abatement costs for some firms turn out to be much higher than anticipated by the government. Sorry, that should say that it expects the price cap to be well above the expected permit price – that is, non-binding. I thought you might like this… It’s about a viral video that Greenpeace just teamed up with Andrew Hansen from The Chaser to do. It makes fun of the idea that the Australian taxpayer will be handing over $1.2 billion to pay coal fired power generators to keep polluting. Next Next post: Why a GSE?